The Lumentek BFDW Series is a “Ballast Friendly” LED Replacement tube. 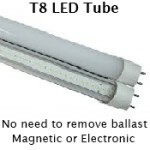 It is a direct replacement for T8 & T12 fluorescent lamps. It operates on most non-dimming Instant Start, Rapid Start, Program Rapid Start electronic or magnetic ballasts. The BFDW Series tube can also be Direct Wired if desired or if the ballast should fail. 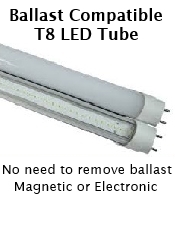 Advanced circuitry allows the LED tube to operate on most ballasts (even some failed ballasts*) eliminating ballast losses**. For the first time there exists a universal replacement lamp that is safe and provides a single replacement item by eliminating the need for high voltage circuitry from the ballast. * Will operate on failed ballasts if the ballast fails in a way that maintains continuity. ** Eliminates Ballast Losses – The wattage and lumen output are the same when operated either direct wired or used with a ballast. High Lumens Per Watt – Up to 118 lumens per watt. High Color Rendering – 81 CRI. Long Life 50,000 hours operation. Available in 18 watt or 21 watt versions. Cooler operation extends existing ballast life. Universal 120-277 Volt Direct Wire operation. Operates LED and Fluorescents on the same ballast. Ballast Friendly operation does not disturb the fixture’s existing wiring.